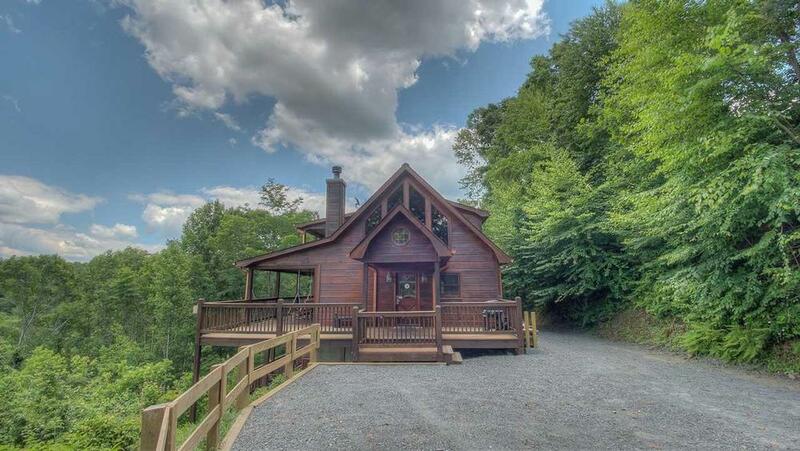 If you have high hopes for your precious time away, High Expectations is the North Georgia Mountains cabin rental for you. This is where wishes come true and joyful memories are made, a place where your spirits will soar and a sense of freedom and fun is in the air. 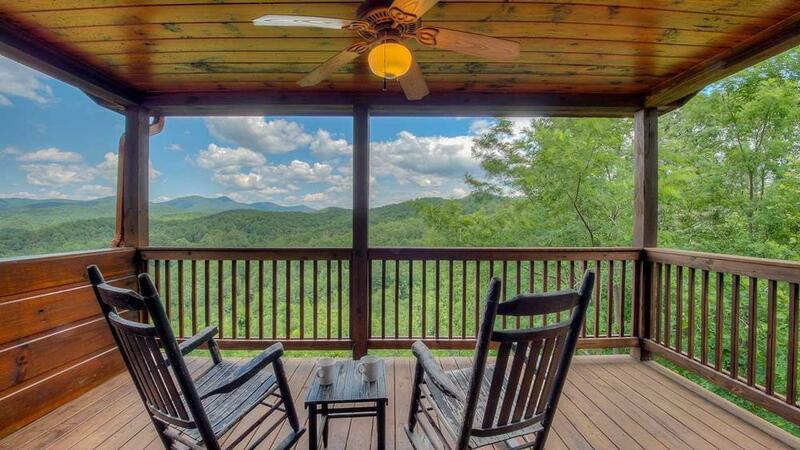 Located just a short 20 minute drive to the wonderful shops, restaurants and wine bars of downtown Blue Ridge and a half hour to Murphy, NC, where you can try your luck at the Harrah’s Casino, the cabin is perched on a mountain ridge, providing you with breathtaking vistas as far as your eye can see. 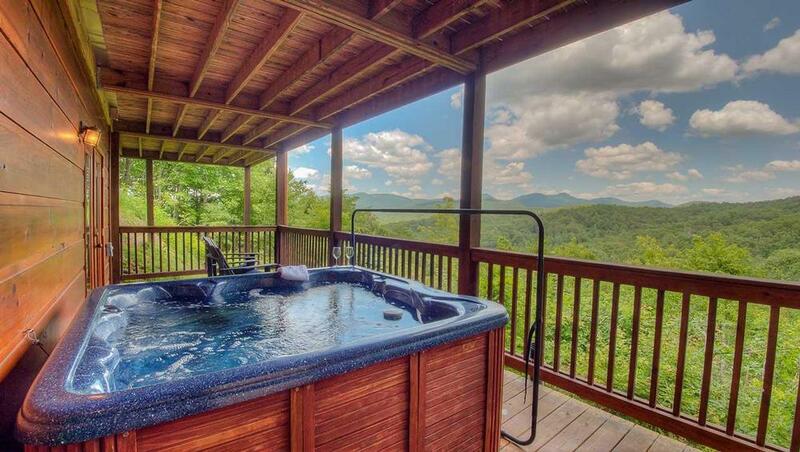 Whether you’re on the main level, in the bedrooms, out on the wraparound decks, or soaking in the hot tub that accommodates six, you’ll take in up close and long range views of the mountains, each one worthy of a picture postcard. 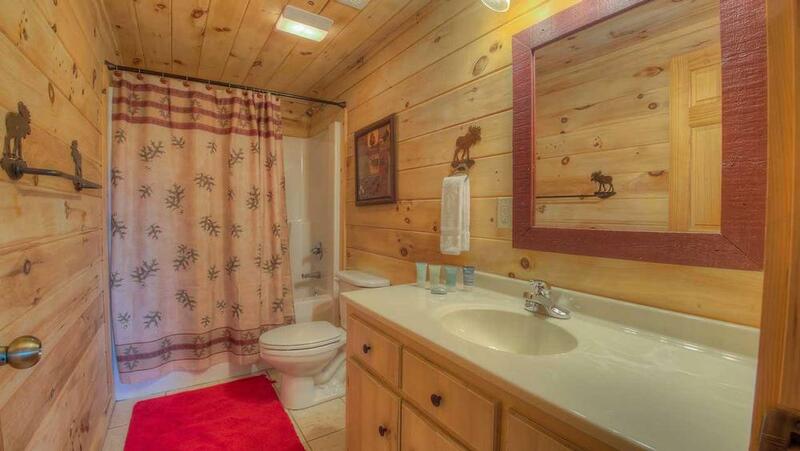 Open and sunny with sky high ceilings and warm pine walls, High Expectations draws you in with its professionally decorated setting and wildlife motif, with fishing, bears, moose, and game themes greeting you in different areas throughout the cabin – right down to the family room’s fish-themed rug! Outdoor enthusiasts have come to the right place. There is always something new to do and see here. Go for a refreshing hike on a local trail, or traverse the hills on horseback. Grab your golf clubs and hit the links, or head down to the river for a day of fishing, swimming and tubing. 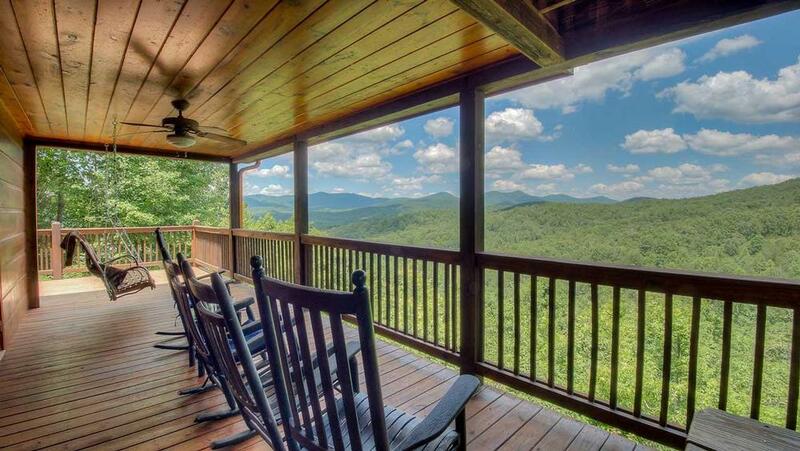 Back home you can spend a lazy day on the deck’s rocking chairs and porch swing, gazing out at the wide expanse of mountains and blue sky before you. Here in these beautiful surroundings, you’ll feel far from the busyness of city living, hidden away in your own peaceful paradise. If indoor activities are more your speed, you’ll be right at home here too. Have fun all afternoon playing pool or foosball. Pair up in teams to play board games or cards, or go one on one with checkers and chess. 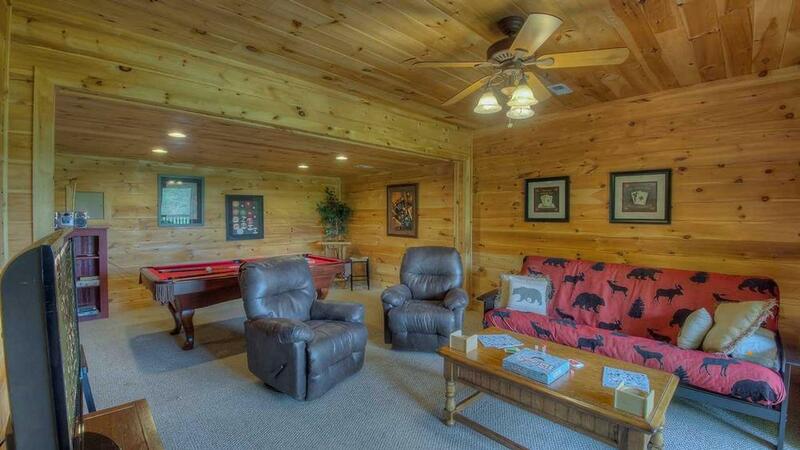 Enjoy a ball game or movie on the large flat screen TV. 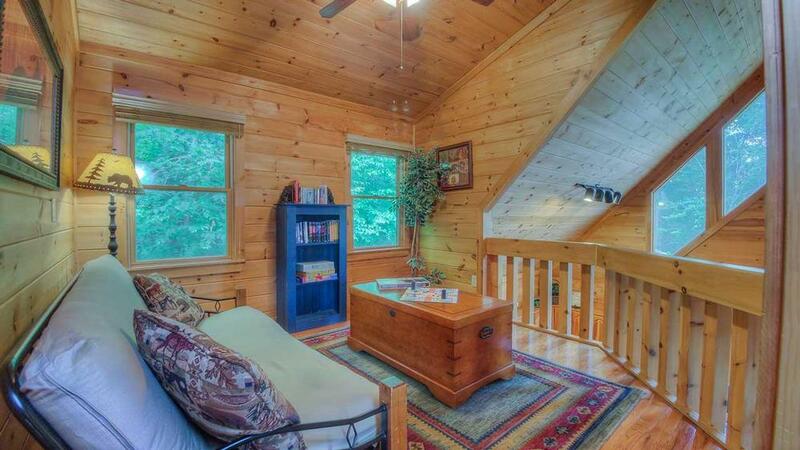 Or simply curl up with a good book in the cozy loft and lose yourself for hours in another world. Later in the day, grill some fresh fish and have an early dinner out on the picnic table in the fresh air. Then spend a relaxing evening settled into an Adirondack chair with a cool drink and watch the stars appear in the twilight sky. 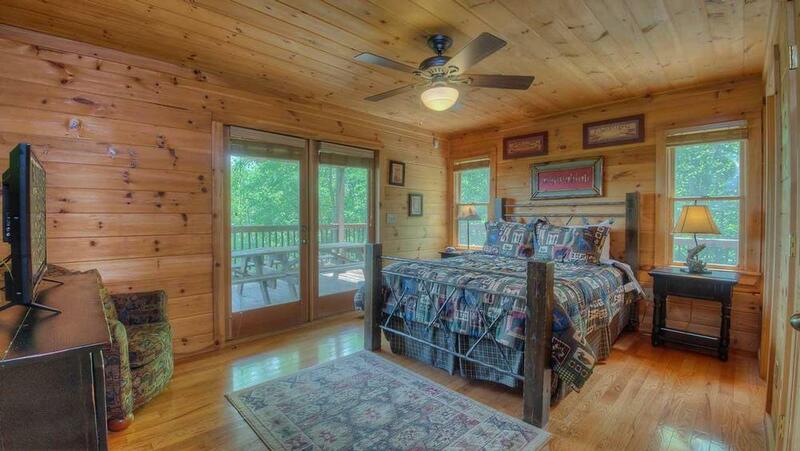 Ride off into the sunset in the Western-themed master suite upstairs with its custom log bed and private walkout porch. 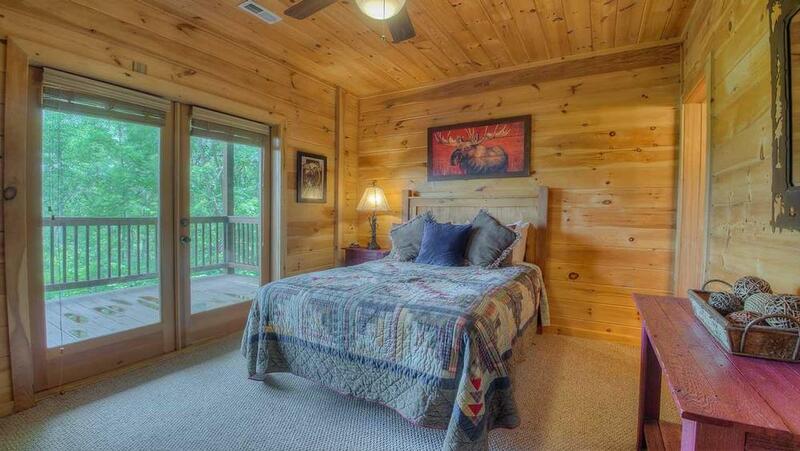 There’s also a queen bedroom on the main floor that opens out to the deck, and a queen bedroom in the basement that opens to another deck and the hot tub. 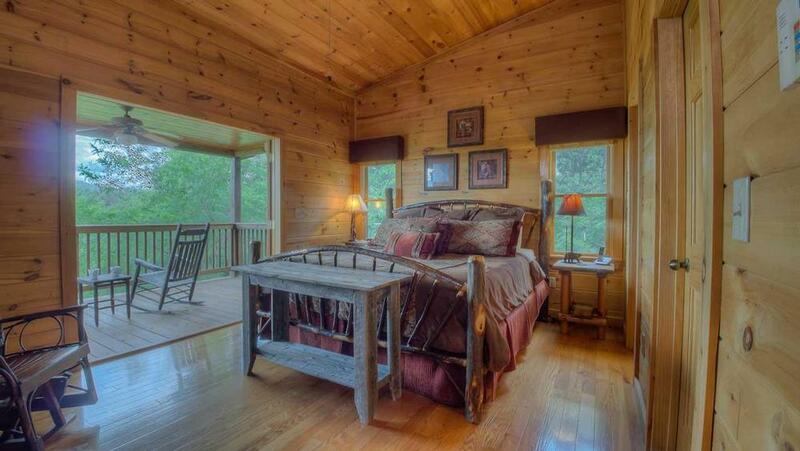 Each cozy, themed bedroom is situated on its own floor for added privacy, all with their own bathrooms. High Expectations is a place for friends and family to escape, put aside their busy lives, and spend time enjoying each other’s company; a place where relationships are built and strengthened among the natural beauty of the mountains. Bring the ones you love here for a vacation that will truly exceed your High Expectations. 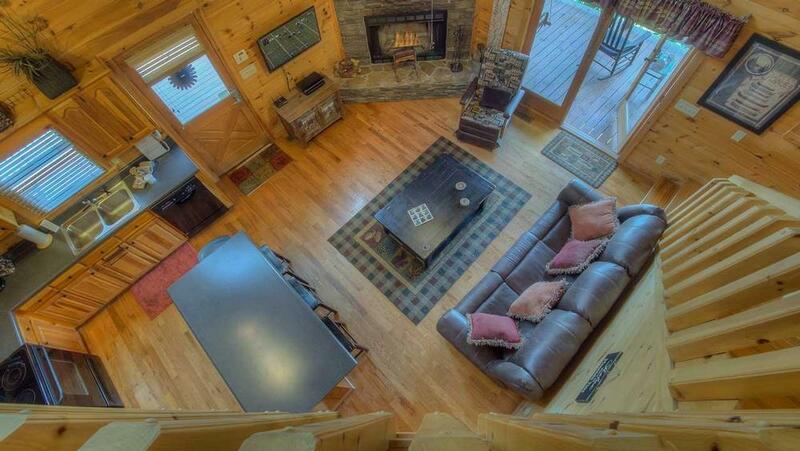 11/18 - We enjoyed the game room and the fire pit...very nice cabin. 10/18 - The scenery looking out on the balcony and the patio toward the woods and the mountain Views, it was awesome. I loved it. Very, very friendly staff, if there were any questions I knew I could call and ask. 07/18 - The whole house was wonderful. The view was gorgeous, loved the hot tub and game room. Very friendly and helpful staff. 4/18 - Enjoyed the game room and the hot tub. Great company! Easy to get someone to speak too! We loved the view and the hot tub. 10/17- Tastefully decorated and well equipped. Very comfortable with a fantastic view. Lovely home. Relaxing and fun weekend. All bedding and linens are very nice quality and comfortable. Very thorough and professional. Lots of wonderful homes to offer. 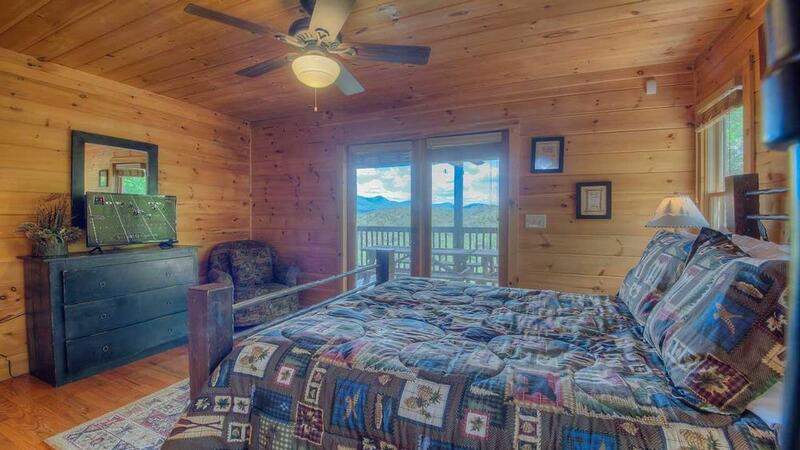 Escape to Blue Ridge has a great reputation with local businesses (highly respected). 10/17- Need clean up outside deck. 07/17- Clean, great views and exactly how you described it. Honest, staff are courteous and willing to satisfy. 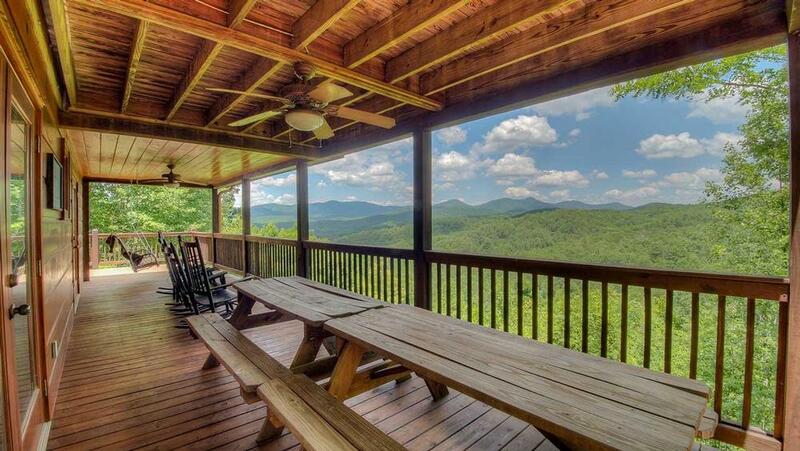 05/17- We enjoyed the overall home amenities and certainly the view. Your company and representatives were all courteous and helpful. Thank you. 02/17- Quiet and private but, still not too far to downtown Blue Ridge and shops. Very professional company. We've stayed in several cabins over the years and all the cabins are immaculate and well maintained and the service is excellent. 10/16- Lovely view, very peaceful. Great service. 10/16- The bedrooms and bathrooms were clean. 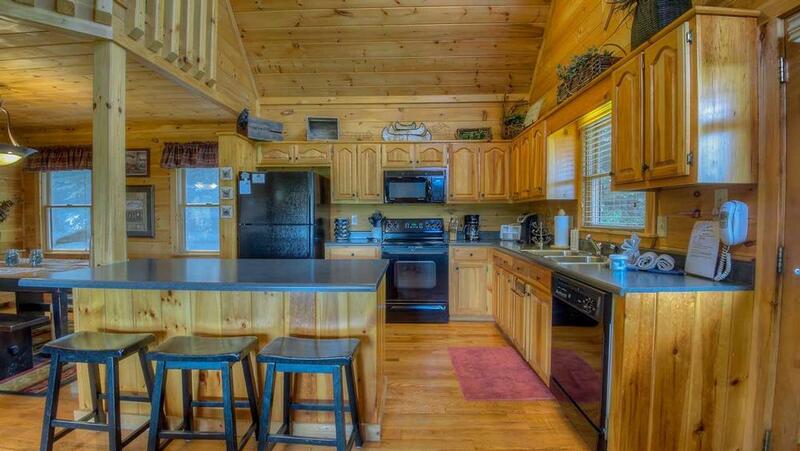 I liked the setup of the cabin. I also liked that it had all of the cooking supplies that I needed. 10/16- Beautiful, as described, felt like home. Impressed with Escape to Blue Ridge. 07/16- Great view, clean cabin, very pleased. 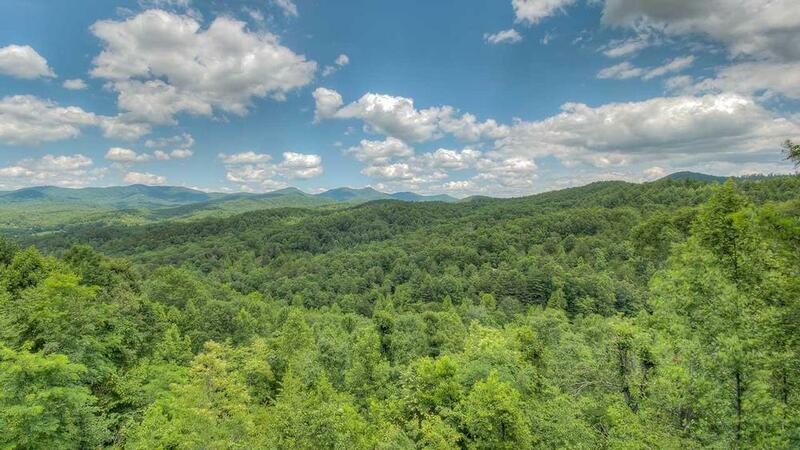 07/16- The view is one of the best I have ever seen in the Blue Ridge area. The home is tucked away, but there was some traffic noise from the community residents and for the construction that was going on around us. Having 3 floors was great for the extended family we had. The game room and hot tub made the younger members of our group very happy! The drive to the cabin was also very easy. 06/16- Cleanliness upon arrival, bathrooms on all floors, the view. Very easy to deal with and very helpful. 03/16- We enjoyed the quietness ! The house was very nice. Neat and clean! Wonderful experience!! 01/16- Everything was wonderful! House was perfect! Escape to Blueridge staff are A++!! Have always loved this company! 01/16- Favorite features: The hot tub, the beautiful view of the mountain range, each bedroom had a private balcony and bathroom. The game room downstairs. Very responsive and incredibly pleasant to deal with. Would definitely use again! 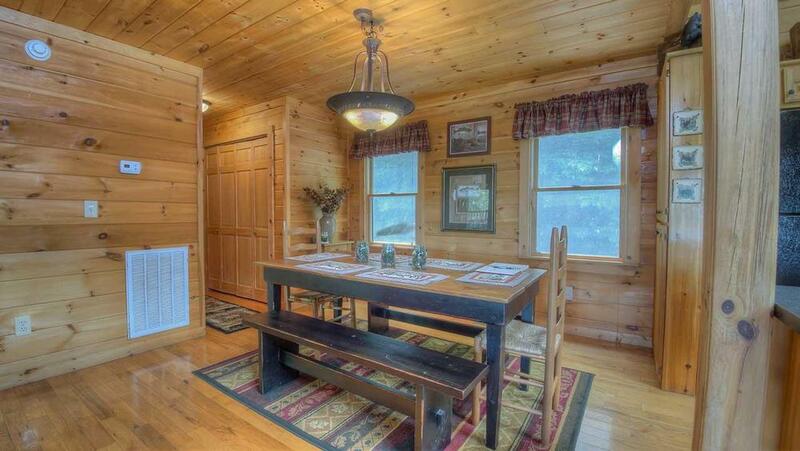 12/15- Very nice cabin with all items in working order. Quite area. Kitchen was well stocked with items for cooking. Everyone I spoke with was very nice, great communications via email on all codes and directions. 09/15- It was my first time at a cabin and it was a beautiful experience. The interior of the home and the exterior was beautiful...it was just enough space, plenty or privacy, and relaxation. I had a really nice time. The only bad thing was I couldn't stay longer. 07/15- It has all the comforts of home and anything you would need. The views from the 3rd floor are breathtaking. 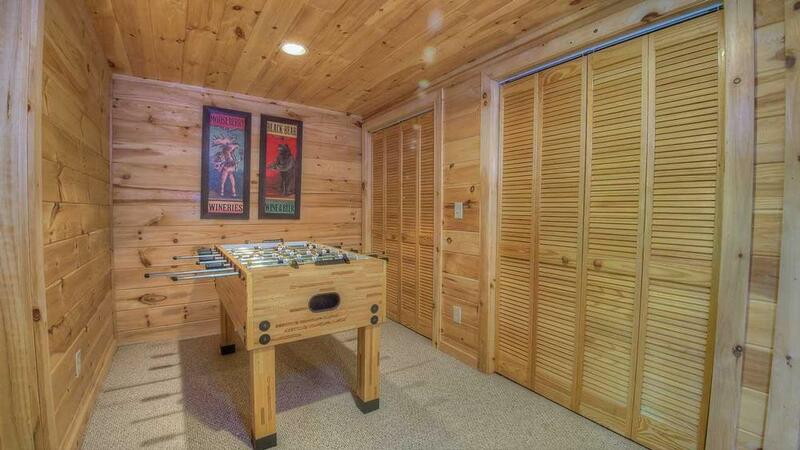 The game room was perfect and even had board games for the kids. There were books in the loft and a great place to do some reading. People are always very friendly and helpful when I called. 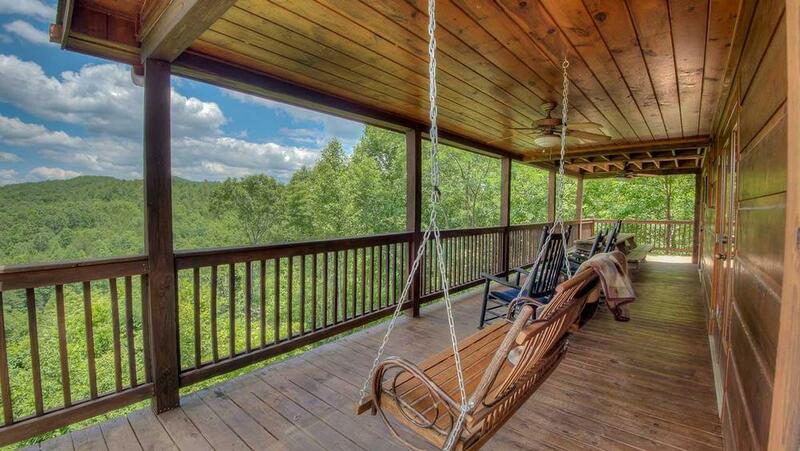 I would definately rent this home and from here again. 06/15- The french doors in the upper bedroom that open up to a spectacular view was the most valued feature. The cabin was very comfortable and was equipped with the essentials. Very private, too. This is my second time to use Escape to Blue Ridge and I will continue to check out to see what's available with you guys. 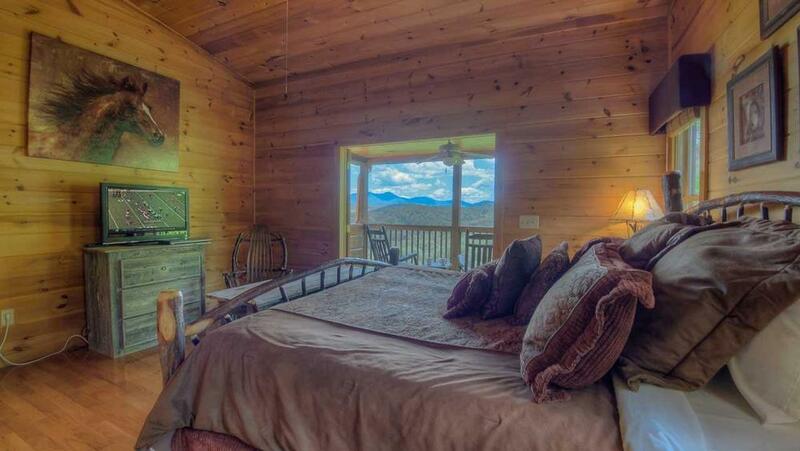 This cabin has by far been my favorite because I am all about the view. 05/15- it was secluded... did not see any other people the whole time we where there... the cabin was just perfect for me and my family. 04/15- The view, the hot tub, the furnishings....so cozy! 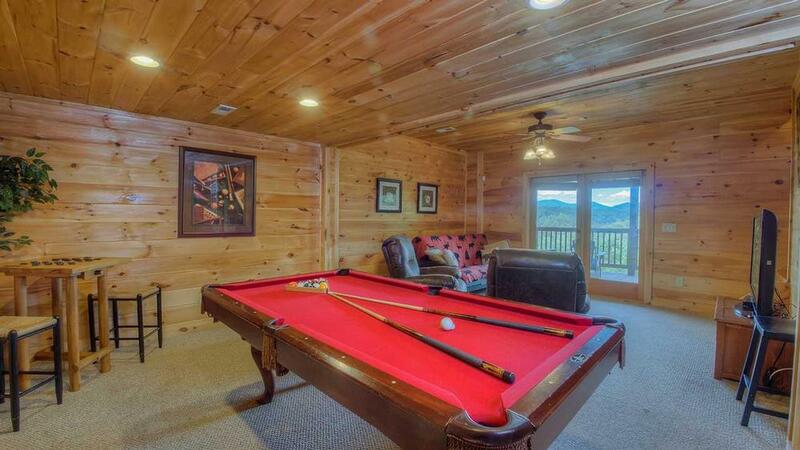 03/15- The view, decor, hot tub and game room were fun! We had an amazing experience using Escape to Blue Ridge. 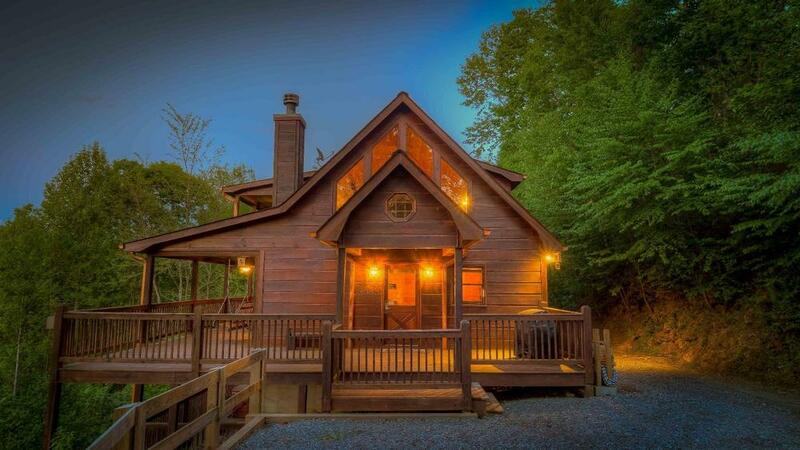 This was our first time in Blue Ridge and the entire experience was easy thanks to easy reservations, an extraordinary cabin and wonderful customer service. I have and will highly recommend using you all to anyone who is looking for a mountain getaway. 02/15- All floors had separate living and bathroom space. Overall a great experience. 12/14- The views were fantastic! 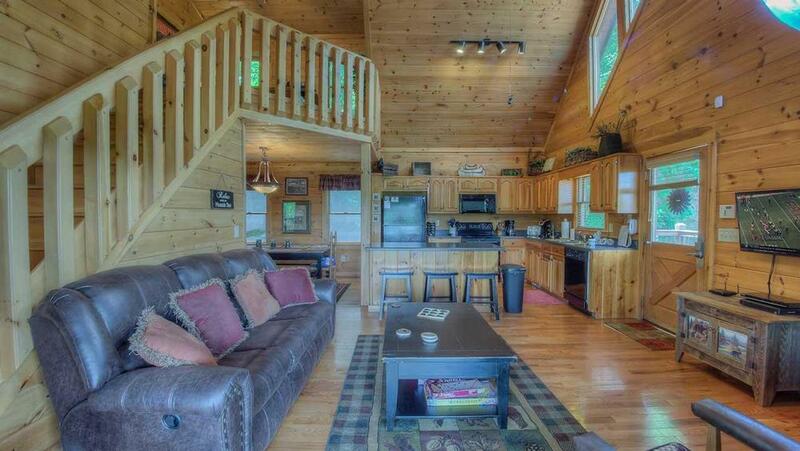 12/14- The space, view, amenities, and fireplace. Being far enough away from the other cabins but close enough to know you're not out there all alone. Some of the nicest customer service I have encountered ever or in an extremely long time. Was treated with nothing but respect and care for my stay and making sure that everything was handled correctly and timely. 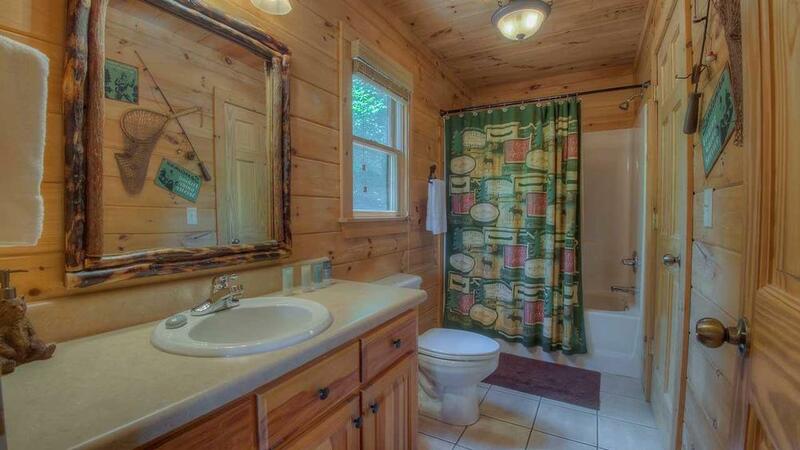 11/14- Hot tub, fireplace, each bedroom having it's own full bath, ease of finding place and accessibility of the cabin. 10/14- Everything was very nice! Hot tub and view were awesome!! 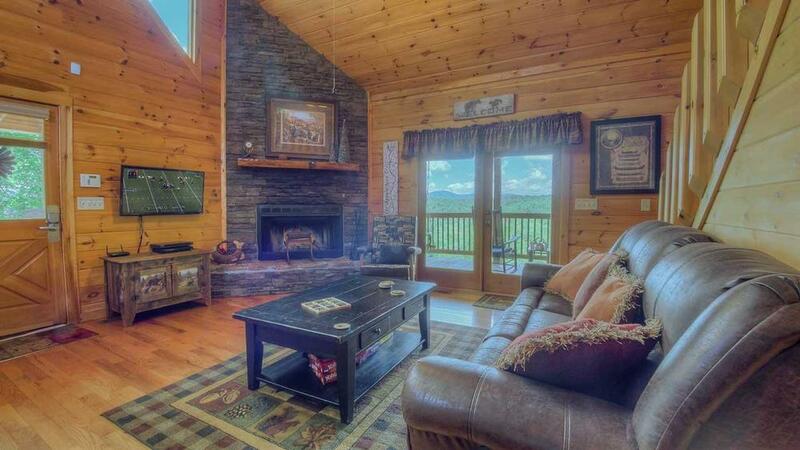 10/14- Great view, wood burning fireplace, well-equipped, everything worked well. 10/14- The home was extremely clean. We loved the floor plan with all 3 bedrooms on a separate floor and they all had their own bathrooms and door to balcony. The view was spectacular. The whole rental experience was top notch. Every detail was considered and taken care of. We will definately rent again. 09/14- Killer mountain view, easy access. We have used EBR for 6 different cabin rentals over the last few years and have been very satisfied with the service and the quality of the rentals each time. 08/14- This cabin was very spacious. There were 6 guests and we all had plenty of room. 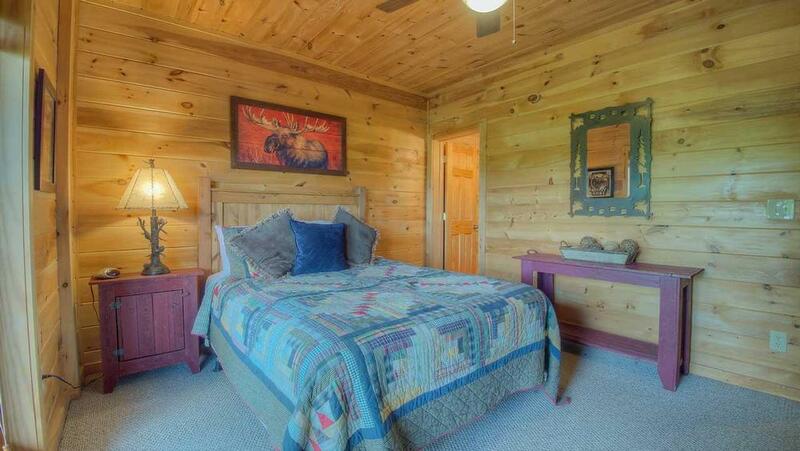 I had the pleasure of sleeping in the master bedroom which had a jacuzzi tub in the bathroom which I enjoyed so much. We all loved the view of the mountains from the decks. The game room was a big hit as well. This was my second time visiting and like the first time, I really enjoyed the peace and relaxation I experienced. I would definitely recommend Blue Ridge to others and most importantly, I will be returning again. The reservation staff was very friendly and helpful too. BLUE RIDGE ROCKS!!!!!! 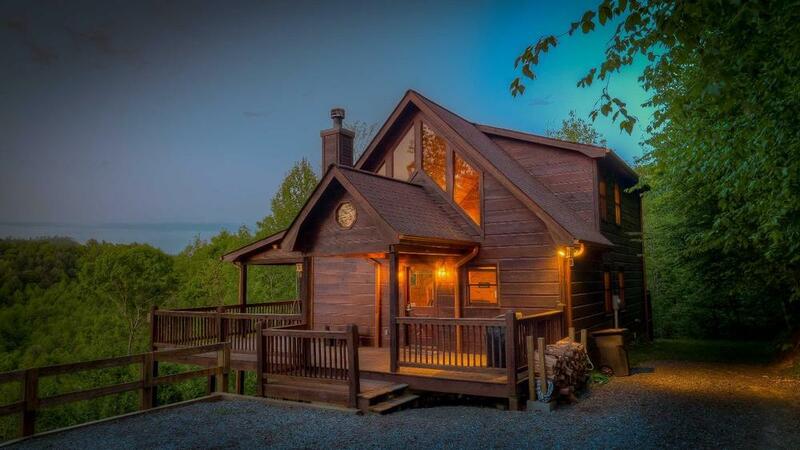 Beautiful luxury cabin with breath-taking view. Tasteful decor and furnishings. We were very happy with this experience. This was not our first trip to Blue Ridge, but was our first experience with Escape to Blue Ridge. Everything was as advertised, and everything went without any problems. 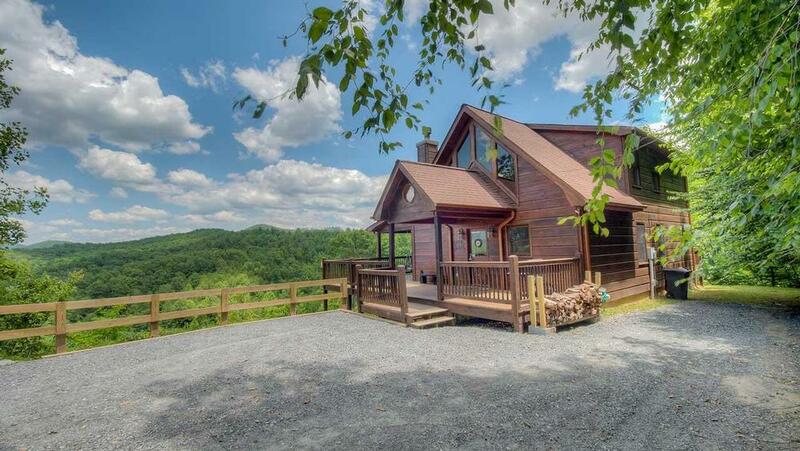 We WILL be dealing with Escape to Blue Ridge again next year, and recommend them to anyone looking for a nice cabin in the Blue Ridge area! High Expectations was a great cabin!! A beautiful view and met all of our needs. It was very clean and well maintained. We will definitely return!!! 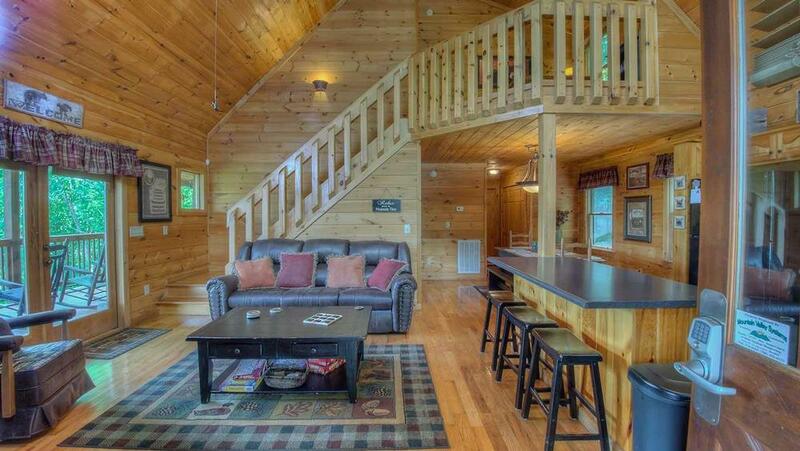 Escape to Blue Ridge was very helpful and I always got immediate emails to confirm payment, etc. I also loved the updates on activities available in surrounding area!! We will definitely use them again!! !